Virtualization marketing veteran, CTXS & VMW, 2010-2016 London & UK VMUG Leader, vExpert 2011-2019, owner of hiviz-marketing, 2 kids, 3 horses, 2 dogs & husband. 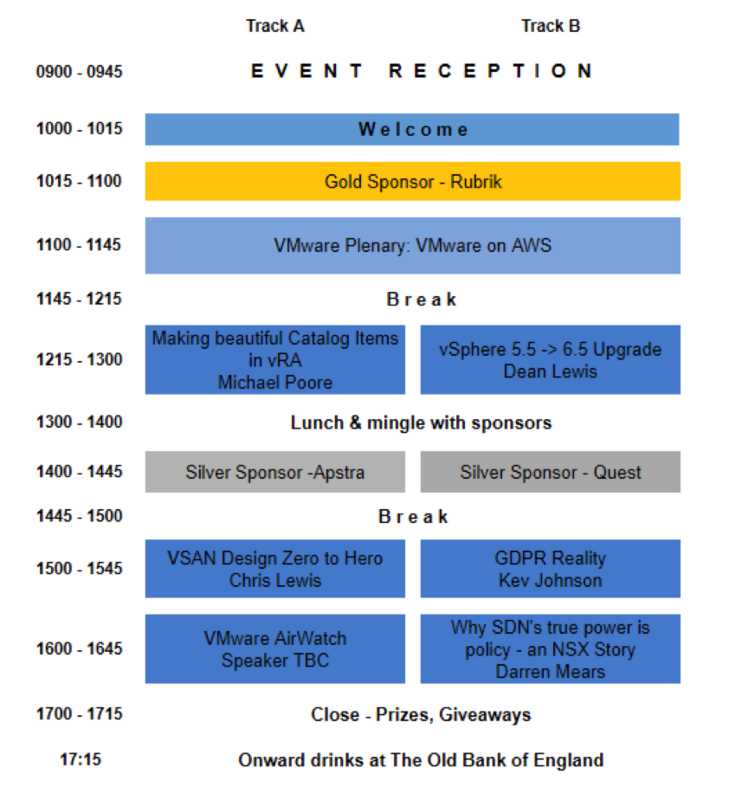 Have just registered for the London VMUG meeting next week. The agenda is looking great, with diverse content applicable for any member, new or old, and with the usual emphasis on community content. Am very aware of Rubrik and Quest, but have never heard of Apstra, so looking forward to learning more about their network management solution. 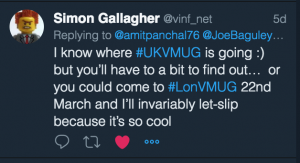 I’m really excited to learn from Simon Gallagher what the venue will be for this year’s UK VMUG – I have an inkling from past conversations as to where it’s going to be held, but am looking forward to it being confirmed. You’ll have to be there to hear it!! For those of you that have followed my crusade to acquire broadband for my rural hamlet, I wanted to share this exciting update! A couple of colleagues highlighted this BBC article to me a few weeks back, London VMUG Chairman Simon Gallagher being one of them. All I can say to you Simon is, THANK YOU. They recommended ordering their router, but not the ‘shoe box’ antenna, to first determine if we could receive a decent enough signal. It was duly dispatched and arrived the following day. Installation is so simple; literally plug it into a power socket. The signal strength was OK, but placing it in the loft provided a boost, so there it remains. On average I’m getting download speeds in the region of 30Mbps and uploads of around 3Mbps – so acceptable and WAY better than my satellite broadband. I did wonder if the ‘shoe box’ antenna would provide a boost, so spoke to the antenna peeps that EE use. They said I’m getting pretty good speeds for my area and that the antenna would provide no additional signal, so not to bother. Great, a £100 saved! The cost of EE is comparable to my satellite, both £60 per month. However, I was restricted to 40GB/month on the satellite, but given I couldn’t stream anything, that wasn’t an issue! With EE I get 200GB for £60, but that is a special offer, so am hoping they won’t up the costs after the term of the contract ends. I can now use VoIP and find that of all the options – Skype, WebEx, Go-to-Meeting, etc. – Zoom is by far the best service, highly recommend it! I’ve also subscribed to Netflix and have just binge watched The Crown. As one of my other friends that recommended looking at the EE service said the other day, “Dead chuffed for you Rimmer that you’ve finally got the Internet!” Yes, dear reader, I am now a 21st century digital citizen! And finally, thank you to James Kilby for answering my question on the vExpert slack channel about how to upload an avatar to your vExpert directory profile. He recommended Gravatar and would appear it’s the only way to upload a profile pic on the new vExpert portal. So, the mystery is how on earth are we now in March and I’ve not blogged since November?! Well, that’s easy to answer, have been soooo busy with a new client. And that’s the intrigue, they’re coming out of stealth at Cloud Field Day on 5 April, so can’t share that bit yet – they’re the ones listed as “secret company” 🙂 Now, to the corporate social responsibility part of this blog. I’ve just spoken to one of their customers today for a case study and supporting quote for the launch press release and it opened my eyes even more to the power of this technology. While many companies endeavor to be cognizant of CSR, it’s often hard, particularly for a start up to focus on this, beyond compliance and statutory requirements at least. However, when your technology enables customers to deliver considerable CSR when deploying technology is really powerful. Imagine delivering a SaaS-type model where there is no Internet connectivity, yet being able to provide productivity applications and then sync when the Internet is available? There are many remote regions that don’t have connectivity, such as war-torn areas. There are facilities that actively remove connectivity to the outside world and yet people residing in these facilities are looking to better themselves, perhaps through online education. Imagine being able to deliver these users the same experience as those in the connected world and making them an equal ‘digital citizen’? That’s a real CSR tick in the box in my opinion. I am so excited about this new client and the possibilities their technology will deliver but have to remain shtum for the time being. It’s been a real pleasure working with Stephen Foskett and his team to prepare for the unveiling on 5 April. Having observed other companies’ success since coming out of stealth at Tech Field day events, I know we’re in very good company, Zerto and Nutanix to name but two. Stephen is well known in our industry and watching previous live streams of vendor discussions I also know it’s a very slick operation and will give my client an inordinate amount of coverage through the delegates social media activity, both during and after the event. The delegate list is a very strong one and good to see a couple of London VMUG members participating, namely Michelle Laverick and Chris Porter and a previous London VMUG presenter too in the guise of Chris Evans! 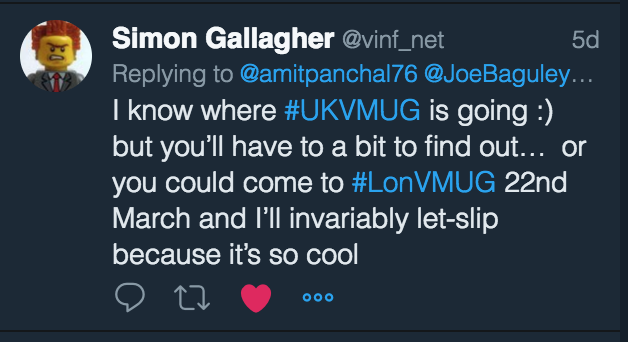 Am also cognizant that I may well be using the vExpert URL shortener for the last time with this post 🙁 vExpert announcements are due out this Friday and while I still play a part in the VMware community around VMUGs, my involvement has not been as strong as in previous years. 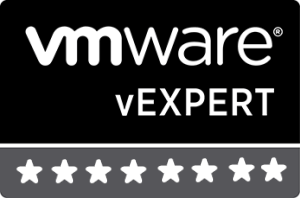 Thus, I won’t be surprised – but still disappointed – if I’m not selected a vExpert for 2018. I am very proud of having been one continuously since 2011 and being part of the community is a very important part of my professional life, so fingers crossed…. Good luck to all nominees!! It continues to amaze me how companies acquire technology and then either do not a lot with it or, in many cases, just kill it. This blog from 31st Oct by Citrix caught my eye https://www.citrix.com/blogs/2017/10/31/the-future-of-octoblu-and-citrix-workspace-iot/ and I started to think about the multitude of tech that has been acquired during my tenure in this industry, the list is truly endless. For this post, I thought I would focus on some of the acquisitions that have occurred on my “watch”. The one that makes me most sad is Vizioncore vRanger. In its heyday, it was the leading 3rd party VMware back up solution – it was the dominant player in the mid 2000’s prior to Veeam’s dominance. I was proud to be a consultant to Vizioncore and the team from early 2006 to mid 2009. Quest acquired it (and the company) in 2008 and that was the start of a its downward path. New versions that were developed had significant issues and there was much market trashing going on in 2010 IIRC. Quest still sells vRanger, and has ported it to HyperV, but its decline is vSad to me and I don’t hear of it being used by customers or being mentioned anymore in the circles that I move in. 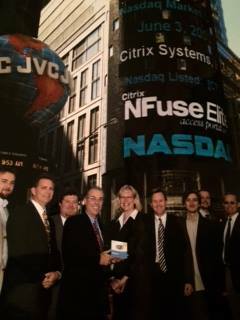 During my tenure at Citrix, many companies and technology were acquired. The acquisition of Insignia took place in early 1998. Some of the tech was integrated into WinFrame, but the key assets were the developers in my opinion, plus the opportunity to rapidly build out our UK presence. We went from a serviced office in Bracknell to Insignia’s offices just outside High Wycombe. So that acquisition was actually fruitful! Others were not so successful! There was video technology from an Israeli company, there was the Sequoia acquisition that was going to make us a leader in portal technology – NFuse was the product outcome and I attended a launch of it at the Nasdaq in New York with a number of European journalists – and, of course, there was the eye-wateringly expensive XenSource acquisition (I’d left by then!) A list is available on Wikipedia of all 49 acquisitions/mergers – I’d wager that the majority of them have disappeared into oblivion! VMware too has made many acquisitions, some are now bearing fruit (NSX via Nicira) but some have either fallen by the wayside or have been sold back out – Shavlik and Zimbra to name but two. I’m a bit perplexed as to why the CloudVolumes acquisition in August 2014 doesn’t appear on VMware’s own list – have I missed something? Whilst the acquisition of Sun Microsystems by Oracle in 2010 wasn’t on my “watch” having been a Sun employee back in the good ol’ days, it is one that matters to me. A good friend was pretty senior in Sun at the time of the acquisition and what followed was the epitome of how not to integrate people. I won’t disclose details but it was a nightmare for them and resulted in a nervous breakdown, it was that bad 🙁 But it would appear Oracle has now shutdown SPARC and Solaris according to this article by ZDNet in September. So, despite spending over $7bn, Oracle let the sun set on a great set of products in my humble opinion. Of course, many mergers and acquisitions are successful but I still wonder about the many unsuccessful ones – how on earth do companies’ executives get away with spending so much money only to discard the technology in time? Answers on a postcard please! Wow, just realized I’ve not posted since August 🙁 Time certainly has flown by these past few months. The reason for my absence is not a good one; I’ve been helping a very close friend through grueling chemo treatment and very sadly she lost her valiant battle on September 21st. I was given the honor to deliver the eulogy at her service on October 25th. It was the hardest speech I’ve ever had to give; yet it was the first and only time I’ve spoken in public and not felt a little trepidation beforehand – quite bizarrely. These moments in one’s life bring home the fragility of life itself and makes one grateful for every single second. Sometimes the daily grind of work makes you forget about the important things in life – health, happiness, family, friends, etc. – so we must all take time out once in a while. Take a deep breath and just relax, remembering all the good things that life can bring and try to forget the sadness and harsh reality of it at times………..
To say I’ve been a little down is quite an understatement, so to read this blog post last night from the “Snark as a Service” man himself, Mr Trevor Pott has buoyed me so much! For him to have taken the time out of his busy day to write this post – despite it being filed under pointless posts and idle ponderings! – not only made me feel very chuffed but also underscores the necessity to say good things at times. I think we’re all too quick to be ‘keyboard warriors’ these days on social media and a little kindness can go a long, long way. So, on the scariest day of the year, I wish you all good health and happiness – and may all your tricks be treats! !